ICC Northwest constructs mixers for vessels and tanks to aid in heat transfer, mix ingredients or adjust the product using gas dispersion or emulsification. 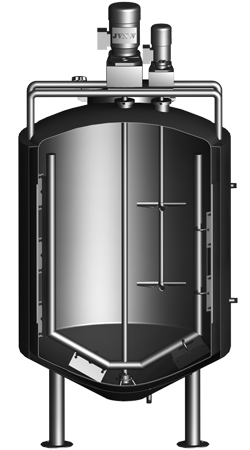 The ICC NW Mix Tank: Where all components are perfectly matched for efficiency and performance. Cleaning devices reach every corner and do not interfere with shafts and impellers. Instrumentation is properly located to avoid false readings. 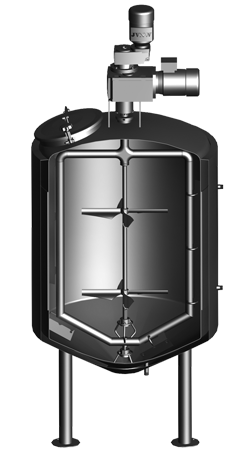 Heat transfer jacketing is sized for batch loads or zoned for flexibility. The whole process from shaft sizing to seal design is more effective when it comes from one source, and that source is ICC NW. We combine tank fabrication expertise with our Mixer Engineering Department to offer a wide range of experience in agitation technology. The following mixer designs are ICC NW’s standard models. Custom designs are also available to meet your specific needs. If a higher viscosity product is required than listed in the process parameters, please consult the factory. 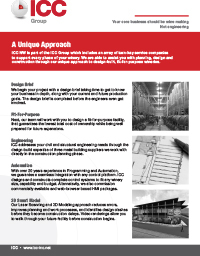 Sanitary Design Experience: ICC NW engineers are well acquainted with 3A, ASME standards, and all applicable codes. The requirement to pass spray-ball coverage tests for mix vessels gives ICC engineers a unique insight into CIP performance on mixers. 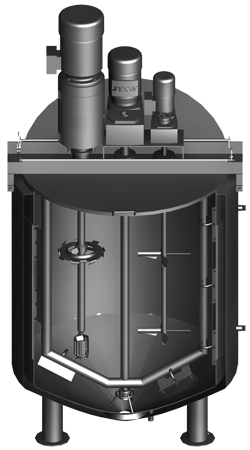 The Mixer Test Lab uses the principle of rotational viscosity measurement. 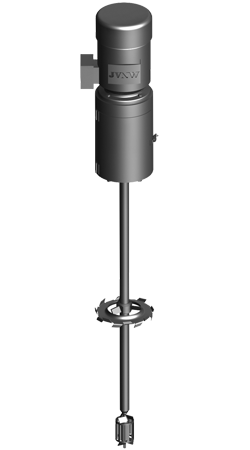 A spindle is immersed in the fluid sample and the torque resistance is measured at a constant speed. The programmable viscometer will accurately (+ or – 1%) measure fluids with viscosities from 15 ­ 6,000,000 cps (centipoise). On-site analysis is a service offered by ICC NW. NIST traceable viscosity standards, data capture and retention capability (including temperature) are also provided. The rheology of the fluid is important, as well as the desired mixing levels, utilities available, time constraints, and any unusual consideration such as, explosive atmospheres, foaming or other unique mixing characteristics. Elastomers: Gaskets and O-rings are fabricated from food-grade compounds. ICC Northwest’s Standard Sanifoil Mixer. This design is very easy to CIP wash. The mixer provides robust radial and axial flow. 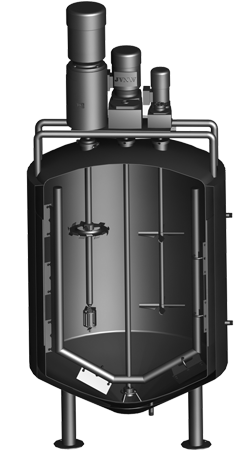 Efficient blending of miscible liquids and easily dissolved solids, producing batch uniformity and aiding in heat transfer. ICC NW’s Light-duty Sanifoil Mixer. This design is very easy to CIP wash. The mixer provides robust radial and axial flow. Use for light duty blending and mixing of low viscosity products, producing homogenous mixtures and solutions. 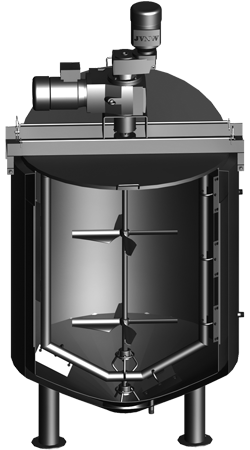 ICC NW’s Heavy-duty Sanifoil Mixer is built with larger, slower moving impellers. The mixer provides robust radial and axial flow. Use for the effective mixing and dispersion of light solids and moderately viscous liquids, producing batch uniformity and promoting heat transfer. 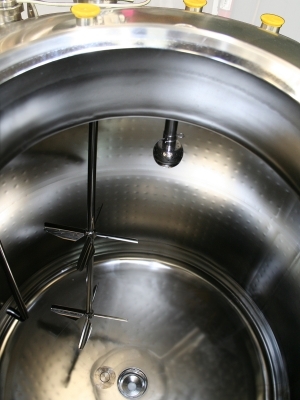 ICC NW’s Horizontal Mixers provide gentle blending and maintain uniformity in large vessels. CIP-able seal design unseats seal components for complete cleaning of all wetted surfaces. 2-speed motors will prevent foaming and splashing when mixer is operated at or near product level. This mixer is readily disassembled, without tools, for inspection of seal components. Use for the gentle blending of low viscosity products, producing and maintain batch uniformity and facilitate heat transfer. Wide variety of impellers available. ICC NW Sweep n’ Stir Mixers feature the same rugged heavy duty bearings, lower sanitary steady bearing, and gear reducer protection included with the Vintage series. 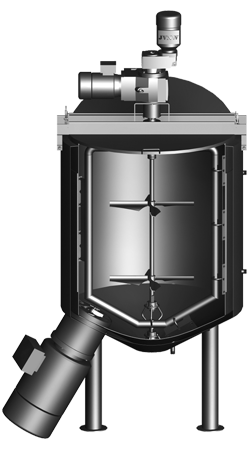 On-center mounting with sanitary removable and adjustable angle baffle. The close clearance lower blade provides low level, gentle sweeping action and is easily cleaned. Additional upper blades are available for tall tanks. Use for the thorough mixing of higher viscosity products without producing excessive foam, maintaining mix quality and aiding in heat transfer. 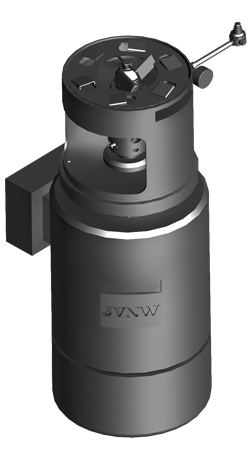 ICC NW Sweep n’ Stir Mixers feature the same rugged heavy duty bearings, lower sanitary steady bearing, and gear reducer protection included with the Vintage series. 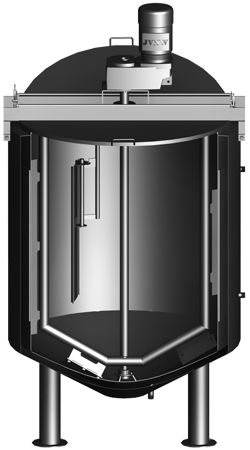 On-center mounting with sanitary removable and adjustable angle baffle. This mixer will handle higher viscosity products that flow impeller style mixers cannot efficiently address. Use for the gentle mixing of high viscosity miscible liquids and dispersion of large solids, maintaining batch uniformity and promoting heat transfer. ICC NW Scrape n’ Fold Mixers feature the same rugged heavy duty bearings, lower sanitary steady bearing, and gear reducer protection included with the Vintage series. 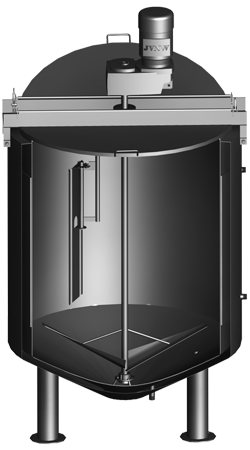 On-center mounting with sanitary removable and adjustable angle baffle. 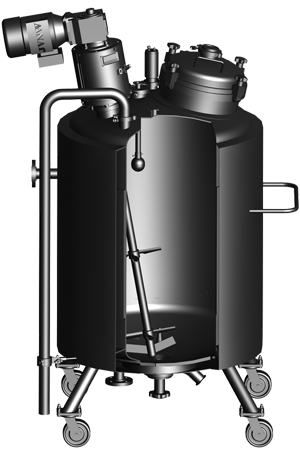 This mixer gently scrapes the bottom and sidewalls of the vessel to prevent product burn-on and for good mixing performance on the highest viscosity products. Conical or hemispherical bottoms are preferred to ensure good performance. ICC Northwest’s Offset Mount Mixer is used in applications where more than one mixing action is required, and for processors who require the flexibility to address a wider variety of products. The most common configuration is a center mounted scraper with an offset turbine style mixer less the steady bearing. Other configurations include a center sweep style mixer and substituting a high shear style mixer for the offset turbine. This style of mixer is constructed where one mixer is concentrically mounted and one is off-set, allowing for an optional third mixer. A sanitary steady bearing is used to support the center shaft, eliminating the bending moment caused by offset mounting. A rigid cross arm stiffens the scraper frame to handle the most severe service. The most common configuration is a scraper/turbine combination. 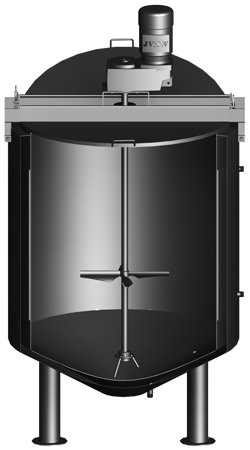 For additional product movement in high viscosity applications, multiple flow impellers are combined to ensure complete product movement with no dead zones. ICC NW Concentric Mount Mixer is used in applications where more than one mixing action is required, and for processors who require the flexibility to address a wider variety of products. The most common configuration is a scraper/turbine combination. Other configurations include a center sweep style mixer and substituting a high shear style mixer for the turbine. This style of mixer is constructed where both mixers are concentrically mounted and rotate in opposite directions. Two sanitary steady bearings are used to support each shaft eliminating the bending moment caused by concentric mounting. A rigid cross arm stiffens the scraper frame to handle the most severe service. The most common configuration is a scraper/turbine combination. For additional product movement in high viscosity applications, multiple flow impellers are combined to ensure complete product movement with no dead zones. ICC NW’s Triple Duty Mixer is used in applications where high shear mixing is required in addition to dual motion. These mixers are the most versatile available and provides a universal mix tank that can handle nearly any product. Used in applications where high shear mixing is required in addition to dual motion. These mixers are the most versatile available and provides a universal mix tank that can handle nearly any product. The most common configuration is a center mounted scraper with an offset turbine style mixer and an offset top entry high shear mixer. ICC NW’s Triple Duty Mixers provide high speed, high shear vigorous mixing action for dissolving difficult to wet powders and gums that require a shearing action to break up clumps. 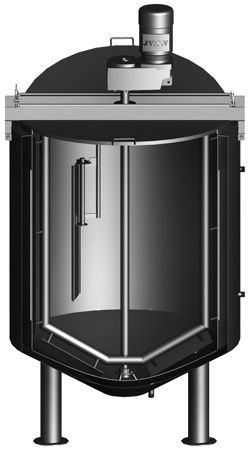 Available in both top entry and bottom entry configurations. 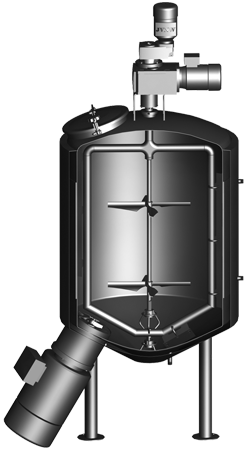 Housed in a stainless steel mount with oversized bearings for long life. Bottom entry style mixers feature a double mechanical seal for long life and are available in a belt drive configuration to eliminate the possibility of water entry into the motor. These mixers are designed to solve the most challenging of mixing problems. Used in applications where high shear mixing is required in addition to dual motion. These mixers are the most versatile available and provides a universal mix tank that can handle nearly any product. 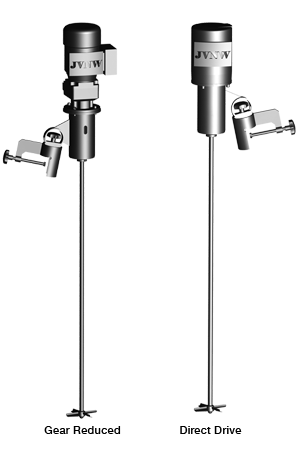 The most common configuration is a center mounted scraper with an offset turbine style mixer and an offset top entry high shear mixer. ICC Northwest’s Shear Vigor Mixers provide high speed, high shear vigorous mixing action for dissolving difficult-to-wet powders and gums that require a shearing action to break up clumps. 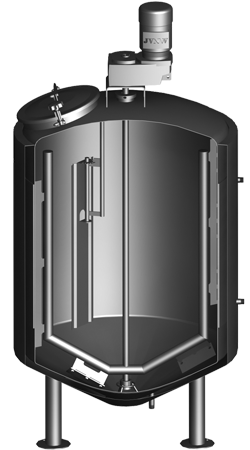 Housed in a stainless steel mount with oversized bearings for long life. Bottom entry style mixers feature a double mechanical seal and are available in a belt drive configuration. ICC NW Shear Vigor Mixers provide high speed, high shear vigorous mixing action to dissolve difficult-to-wet powders and gums that require a shearing action to break up clumps. 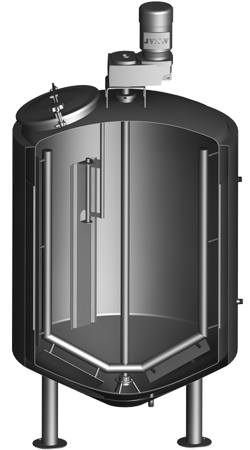 Housed in a stainless steel mount with oversized bearings for long life. ICC Northwest’s Portable Mixers can be clamped in place to the sidewall of an open top vessel or clamped to a mounting bracket welded to the sidewall of the vessel (preferred). 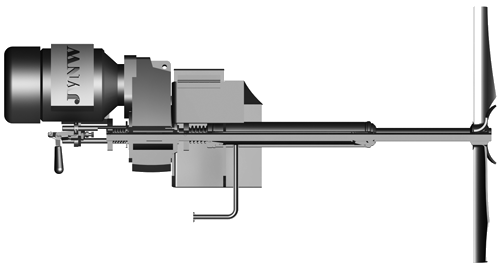 The proper mounting angle is 10-15 degree vertical pitch with a 30 degree offset. 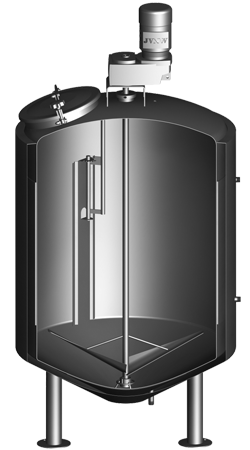 ICC NW Pharmablend Mixers are designed with strict adherence to the ASME Bio-Processing Equipment Standard and 3-A Sanitary Standards. 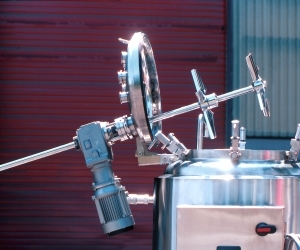 Mounted with a sanitary tri-clamp connection for use on Pharmaceutical vessels to meet sterilize-in-place requirements. An oversized mechanical seal is used to provide the specified 1″ annular clearance. Seal area can be readily visually inspected without the need for tools. A debris well (to trap seal fines) with flush port is standard. 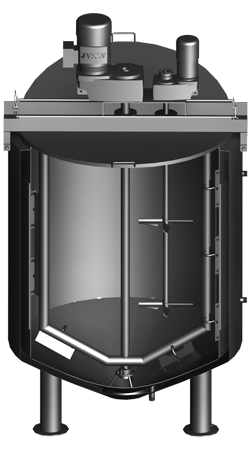 The flush port is used to assist sterilization by ensuring all seal components reach the required sterilization temperature. Direct drives and gear reduced drives are optional. 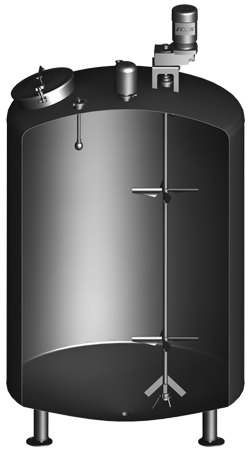 A stainless steel mount with padlockable access door will prevent unauthorized access to the seal. ICC Northwest offers a wide variety of mixing vessels, including: Sanitary Ribbon Blenders, Scraped Surface Horizontal Blenders, Dual-Motion Scraped/Ribbon Blenders, Complete Skidded Mixing Systems and many others. ICC NW also fabricates a wide variety of special purpose mixers such as mayonnaise emulsifiers, saute fryers, and gate mixers for shortening.